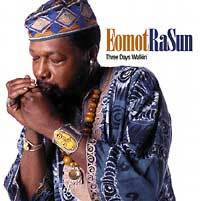 This is Chicagoan, Eomot Rasun's recording debut. Listening to it, however, one would never know. Three Days Walkin shows the musical maturity of a man who has been recording for decades. His clean soulful voice echoes many blues traditions and his harp playing harkens back to his Delta roots and his South Side Chicago boyhood, yet has a modern edge. Listening to this disc, you will know he has an appreciation for Little Walter's music. He is true to Walter's Chicago blues sound but brings his own voice to it, infusing it with a freshness that is a joy to listen to. The same can be said of the rest of the disc. His reverence for tradition is apparent but his own musical vision shines through. If there is any doubt Eomot feels a spiritual connection to the blues, this album proves it. He summons up the spirit of 1950s Chicago as if he just got back from the 708 Club gigging with Walter or Wolf. This may be his debut, but there is a lot of history on this disc. Eomot is walking in the footsteps of his elders, but he is also wearing his own shoes.